Nationally known disability advocate and professional, Ethan B. Ellis, passed away on Friday, March 22nd in Piscataway, NJ. He was 85. During his career, Ethan assisted in the success of the Americans with Disabilities Act (ADA), served as Director of the New Jersey Council on Developmental Disabilities during a time when the state closed two developmental centers, was instrumental in elevating the individual rights and autonomy of people with developmental disabilities, and championed a systemwide shift to services directed by the individuals receiving those services and their designated family members. Posted on April 5, 2019 by Brian Mazzarella and filed under Advocacy. CJ Dodge, ACI and Donald Campbell, Atlantic County Center for Independent Living, testifying at the Assembly Budget Hearings on behalf of the NJ Association of Centers for Independent Living. The 11 CILs are advocating for a 4 million dollar line item in the state budget. If you would like to help, please contact us. Posted on March 28, 2019 by Brian Mazzarella and filed under Advocacy. 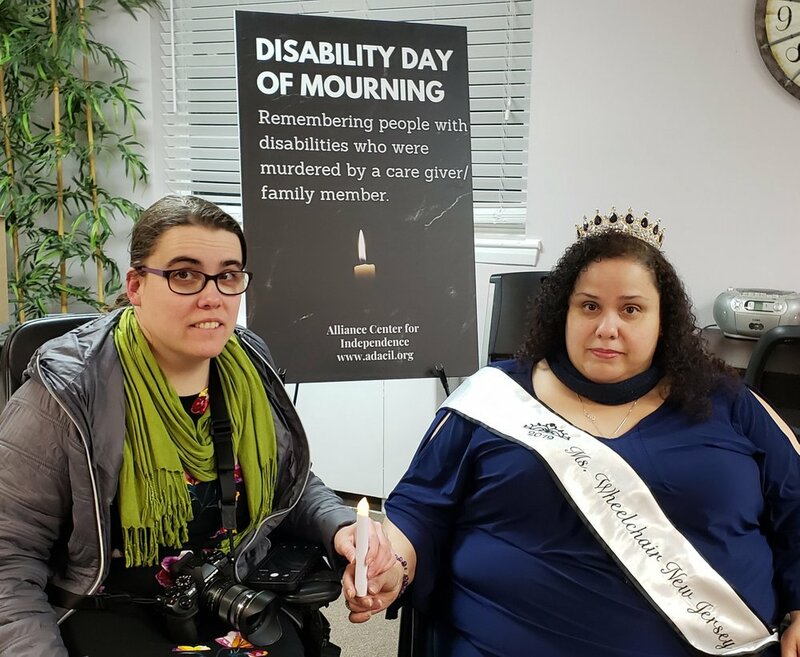 Disability advocacy organizations, including ADAPT and ACI have been advocating for passage of the federal Disability Integration Act of 2019. This proposed federal legislation ensures that any insurance company willing to provide institutional support would also be required to cover home and community based support for individuals with long term services and supports. When enacted, this law will allow individuals the option of obtaining those needed services in their home or community rather than in an institutional or segregated residential setting. In January, the Disability Integration Act was reintroduced in US Senate (Bill no. S 117) and in the US House of Representative (Bill No. H.R. 555). Visit disabilityintegrationact.org for more information. Senator Cory Booker, and Representatives Donald Payne Jr., Bonnie Watson Coleman and Chris Smith have signed their names onto this important bi-partisan (support from Republicans and Democrats) legislation, and we want to thank them. However, several lawmakers from NJ who have not yet publicly supported the Disability Integration Act, including Senator Robert Menendez, Rep. Frank Pallone (6th Congressional District) and Rep. Mikie Sherril (11th Congressional District). Posted on March 6, 2019 by Brian Mazzarella and filed under Advocacy. In the past 5 years, over 650 people with disabilities have been murdered by their parents/caregivers. 184 new murders this year. Disabled lives cannot be valued less than the lives of those without disabilities. It cannot be excused, minimized or normalized. On the night of March 1st, we honored the victims by reading their names out loud. Rest in peace...you are remembered. Thank you to those who joined us on this difficult evening. Posted on March 1, 2019 by Brian Mazzarella and filed under Advocacy. Ask Governor Murphy to Fund Independent Living! New Jersey’s Centers for Independent Living are a vital part of the disability community, yet are consistently underfunded. For this reason, the New Jersey Association of Centers for Independent Living is asking for state funding in the amount of 4 million dollars to be divided amongst the 11 Centers across New Jersey. Please sign our letter endorsing our efforts and showing the Governor the importance of disability-led organizations! Posted on February 22, 2019 by Brian Mazzarella and filed under Advocacy.